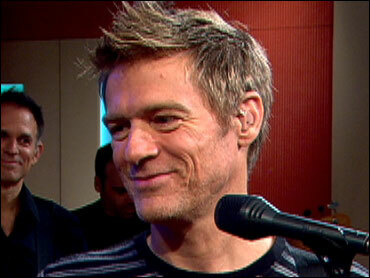 Over the course a career that began almost three decades ago, singer/songwriter Bryan Adams. "The Groover from Vancouver," has assured his place in rock 'n' roll history with hits such as "Summer of '69," "Straight from the Heart" and "Run to You." Earlier this year, he released his eleventh studio album, aptly titled "11." It will, commented the Pittsburgh Tribune-Review, "sound instantly familiar to Adams fans. As usual, the CD is built around hearty and tuneful rock anthems ('Tonight We Have The Stars' and 'Flower Grown Wild') and several rough-hewn ballads ('We Found What We Were Looking For' and 'Somethin' to Believe In'). Since his 1980 debut, Adams has sold more than 65 million albums. He's also built a reputation as a photographer, even shooting a Guess ad campaign this year. On The Early Show Monday, co-anchor Maggie Rodriguez asked Adams how he keeps going. "I love music," he replied, " and we like touring. And it's always interesting, because new songs happen all the time. So, when they happen, it's time to go back in the studio and then, a new album happens like this one this year. "We spent the whole summer in America touring, and we're going to continue to tour probably up until the springtime here." Then, Adams revealed a little-known fact about his 1985 hit, "Summer of '69." "A lot of people think it's about the year," Adams said, "but actually, it's more about making love in the summertime. It's using '69 as a sexual reference."